Militants loyal to radical Shiite cleric Muqtada al-Sadr clashed Wednesday with U.S. forces near a mosque in this Shiite holy city and in Baghdad, and officials said six Iraqis were killed and 40 others wounded. Violence also continued in Baghdad, with the third fatal car bomb in as many days. A vehicle exploded in a Sunni Muslim district, killing at least five people and wounding about 33 others, including children, police said. Explosions rocked the industrial sections of Kufa, where Shiite leaders have been struggling to save a shaky cease-fire. Many of the injured suffered shrapnel wounds from a mortar round that missed a U.S. convoy, witnesses said. Weeks after their capture, three Italian hostages taken hostage in Iraq were shown on a video broadcast Wednesday. Four Italian men working as private guards in Iraq were kidnapped April 12. Soon after, the captors executed one, Fabrizio Quattrocchi and issued a videotape of his killing. The video shown on the Al-Jazeera satellite network depicted the three remaining hostages sitting in chairs and appearing reasonably healthy. At the U.N. Security Council on Tuesday, the United States and Britain circulated a revised resolution that would give the interim government control over the Iraqi army and police and end the mandate for the multinational force by January 2006 at the latest. Ahmad Chalabi, a former Iraqi exile who recently lost his standing as a special friend of the Bush administration, allegedly told Iran that the United States had broken the code of its intelligence service, CBS News has learned. President Bush is casting the war in Iraq as the central focus in a struggle between freedom and terrorism as a caretaker government prepares to take power in Baghdad at the end of the month. In a commencement speech at the Air Force Academy on Wednesday, Mr. Bush was to tell graduating cadets they would be joining a conflict as heroic as World War II or the Cold War. The Army general who reported last fall there was no mistreatment at Abu Ghraib prison in Iraq also commands the criminal investigators now pursuing the abuse cases, drawing concerns by some military law experts about a potential conflict of interest. Militants have apparently kidnapped nine more people: A Turk, an Egyptian, two Poles and five Kurds, according to videotape of the captives and other reports. Three Filipino soldiers were wounded in Iraq when unidentified attackers fired on their convoy, which included some Americans, a Philippine official said. Mortar attacks on a police station near the insurgent stronghold of Fallujah killed one Iraqi civilian and injured three people, including a U.S. Marine, the military said. The city was a hotbed of resistance and the site of a lengthy siege in April, which ended when Marines and Iraqi forces agreed to joint patrols. In Kufa, gunfire reverberated through the largely deserted streets as fighters loyal to al-Sadr took positions near the mosque, where gunbattles have raged in past days. Tanks and Humvees rolled into the center of the city at midmorning, prompting terrified civilians to scramble for cover. Five people were killed in the fighting, hospital sources said. In skirmishes lasting about an hour, two militiamen were injured, fighters said. Al-Sadr's forces and U.S. troops also exchanged gunfire in the Shiite district of Baghdad known as Sadr City, killing one fighter and injured three, officials in al-Sadr's office said. Fighters threatened to conduct suicide operations if talks meant to calm the situation failed. "We will use explosive belts to attack the U.S. tanks," said one fighter, Ali Hussein. Clashes have rocked Kufa nearly every day since Shiite leaders announced an agreement by al-Sadr to end a two-month old standoff with the Americans here and in the twin city of Najaf. One proposal under discussion calls for al-Sadr's militia to withdraw from Najaf over a 72-hour period. In return, American troops would stay away from Shiite holy sites in Najaf and Kufa — where U.S. and militia forces have battled since al-Sadr launched an anti-occupation uprising in early April. Ahmad al-Shibani, an official from al-Sadr's office in Najaf, said al-Sadr's movement will likely have objections to the deal because it calls for them to surrender their weapons and provides for joint patrols including U.S. soldiers and Iraqi police. 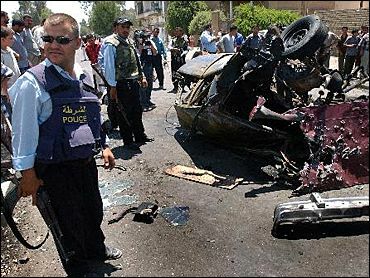 The car bomb in Baghdad exploded in the city's Azimiyah district in the north of the capital. Hospital official Nazdar Kadhim said five Iraqis died and 33 were hurt, including five children. Wailing relatives of the injured gathered at the hospital, only to be stopped from going into the emergency room. Witnesses said two blasts occurred — an initial explosion followed by a second one that went off just as a crowd had gathered. A convoy of sport utility vehicles, favored by Western contractors, had passed by moments before the bomb went off. A grocery bag full of apples lay scattered on the street, dropped by an elderly women injured in the blast. Bloodstains surrounded the blackened and twisted wreckage of the car. On Tuesday, a car bomb killed three people and injured about 20 near the headquarters of the pro-American Patriotic Union of Kurdistan. A day earlier, a vehicle exploded near the headquarters of the U.S.-run occupation authority in central Baghdad, killing at least two people and injuring more than 20. U.S. officials say insurgents will step up attacks in the days leading to the June 30 transfer of sovereignty from the U.S.-led occupation authority to the interim Iraqi government.